We know you’re probably wondering, “Where are the best shipping containers near me in Los Angeles?” When you’re in need of high quality temporary storage solutions for your home or business, you deserve the best. That’s why Haulaway Storage Containers is so successful in what we do. Not only do we make all our customer’s needs our priority, but we’re the number one source for storage containers in Los Angeles! 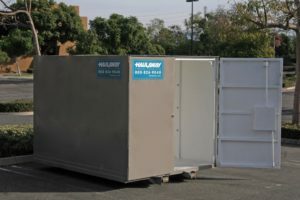 Rather than waste the time trying to secure and transport a storage container to your location all by yourself, Haulaway Storage Containers has the perfect solution. We can deliver and remove all your storage container rentals for you, typically by the next business day! After almost 50 years in business, we’re the leading experts in portable storage containers. No matter what your needs are, we guarantee we’ll have the perfect solution for you. Options ranging from 10 to 40 feet in length give you the flexibility to choose a great fit for your needs, and our containers are constructed from the highest quality 14-gauge steel for superior security. Not only do we use the best materials, but our containers are wind resistant and water resistant. If you’re looking for that added layer of security, consider renting one of our 20’ or 40’ shipping containers. They come equipped with the patented Rhino Locking System so you can rest easy knowing your valuables are safe and secure. We also offer containers with easy double door access on both ends to make your life simpler. Where can I find the best storage container near me? Give Haulaway Storage Containers a call! Our Southern California service center provides expedited shipping options to all of Los Angeles, and it’s easy to get your online quote using our website. What are you waiting for? Call our toll free number today!